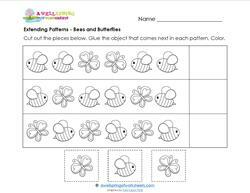 These pattern worksheets offer five different ways kids can learn to recognize patterns. There are ABC patterns where kids represent an object with a letter. We also have color patterns. 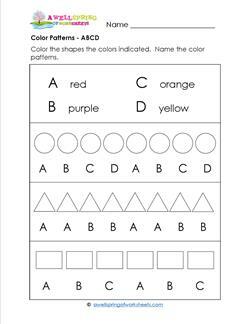 Kids use the guides of ABC and/or a color guide to create the patterns. The size patterns rock! Kids name the pattern and decide if the small item or the larger item comes next. 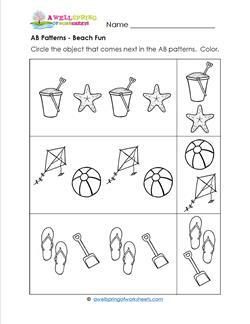 In the extending patterns worksheets kids cut and glue the object that comes next. And lastly, the patterns that are the same use cut and glue objects to create the same pattern with a different set of objects. 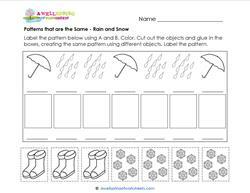 Please go to this page to choose from all the patterns worksheets on this site. 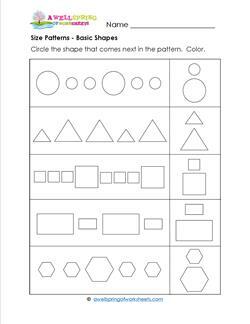 These size patterns worksheets use shapes and other graphics in big and small sizes. Kids circle the smaller or larger sized object that comes next. When they’re done you can have them color the shapes certain colors to slip in some shape identification, too. Now aren’t you sneaky! “Color the circles red and the rectangles blue.” or “Color the big triangles red and the little triangles yellow.” Then have them repeat the patterns to their neighbor using size words like big and smaller or bigger and smaller.